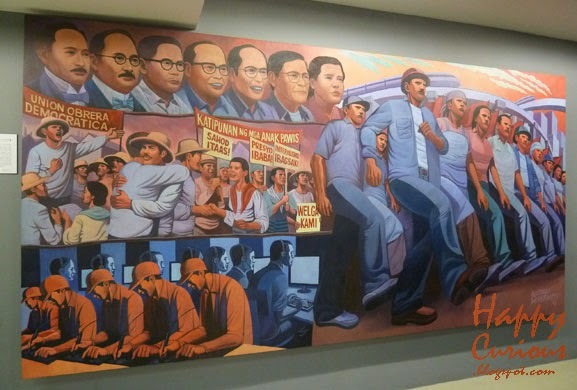 "A picture paints a thousand words" so goes the saying and one Saturday morning, I saw how pictures, paintings in particular, do just that for Philippine history. 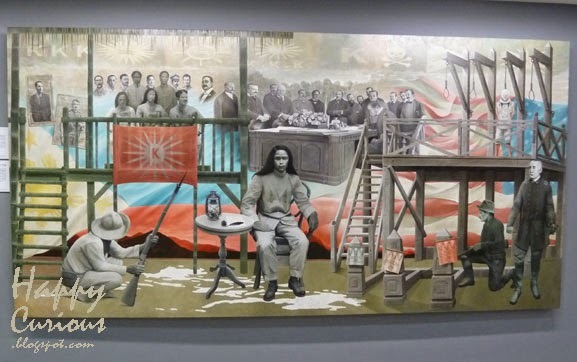 The SiningSaysay: Philippine History in Art exhibit opened last Saturday, February 28, 2015 at the Gateway Gallery in Cubao, Quezon City. As an exhibit dedicated solely to works of art depicting a nation's history, it is the first of its kind in the country. The exhibit is a joint project of the University of the Philippines (UP), the UP Alumni Association (UPAA) and the Araneta Center. It is open free to the public every day from 11AM to 7PM at the Gateway Gallery located at the 5th floor of the Gateway mall. 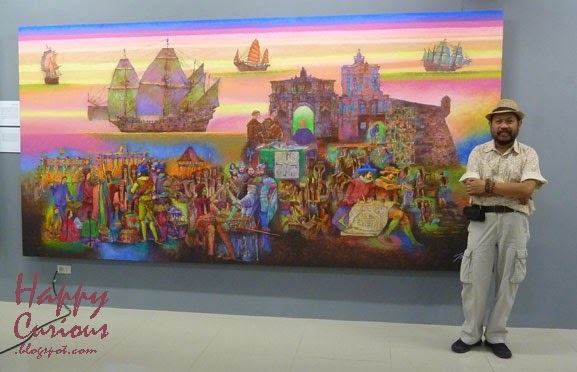 Large paintings give visitors different fragments of Philippine History. The project was first envisioned by the UPAA under Atty. Gari M. Tiongco and took four years to complete. 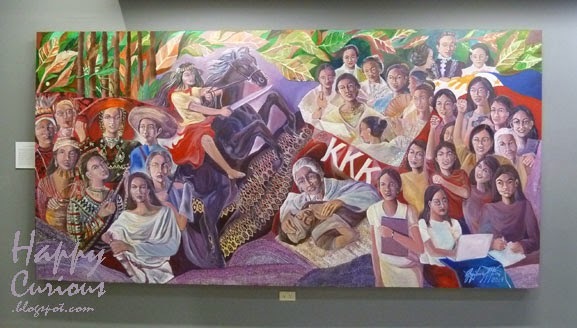 It's concept was to allow students and even tourists to learn about Philippine history just by going through the paintings. 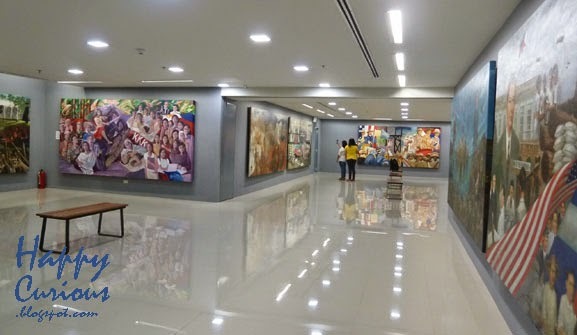 There are 30 large-scale paintings to explore (on 6 x 12 feet canvasses) which cover different aspects and times in Philippine history from the petroglyphs in Angono, Rizal all the way to modern times. 28 alumni artists from UP contributed to this impressive collection. Participating artists include Adonai Artificio, Armand Bacaltos, Adi Baen-Santos, Grandier Bella, Benjie Cabangis, Ben Cabrera, Angel Cacnio, Romeo Carlos, Cris Cruz, Denes Dasco, Gig De Pio, Simkin De Pio, Vincent De Pio, Neil Doloricon, Norman Dreo, Amado Hidalgo, Abdul Asia Mari Imao, Ben Infante, Gigi Javier-Alfonso, Aileen Lanuza, Romeo Mananquil, Norlie Meimban, Julius Samson, Jonahmar Salvosa, Randy Solon, Michael Velasco, Jun Yee, and Janice Young. Aside from doing their own research through various resources, the artists also consulted renowned historians Dr. Serafin Quiazon and Prof. Ma. Luisa Camagay to ensure accuracy in their recreation of details. Artist Johnamar Salvosa posing beside his painting Galleon Trade. During this event, we had the opportunity to talk to one of the artists Mr. Jonahmar Salvosa about his painting and how he worked on it. According to him, he did research for about 2 years together with consultation of their 2 historians to confirm the details of the time's clothing style, activities and other details. His research included going to various libraries and consulting books as well as going to different places with artistic works depicting people in that same time period. Of course, there are some historical facts that are still disputed or impossible to confirm. In his case, there was no definite information on which part of the arm or body the participants drew blood for the blood compact. (A monument to this can be found in Bohol.) So he left the specific detail out and just left the arm of the participants open to depict that the blood compact had occurred. We had a short time to talk to him but it was fun to get to know the artist and how he worked on his painting. 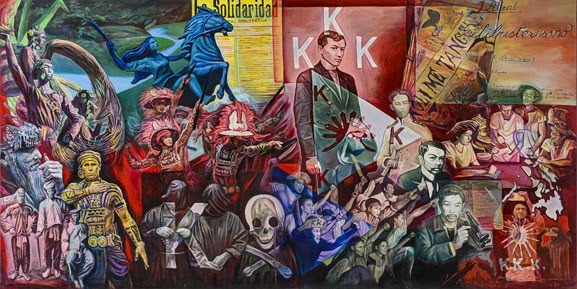 I had even greater respect for these artists who took the time to do their research in order to paint an accurate depiction of Philippine history. Putting up pictures of the paintings would not do them justice here but I will show you some of my other favorites from the exhibit. This painting on women empowerment is from one of my former teachers and thus is a personal favorite. I encourage the whole family to visit this exhibit and learn more fascinating things about our history as well as to get to appreciate these artistic works of art by our local artists. Another notable feature of this exhibit, is that they can be updated to represent new events as well so that they can be considered as a chronicle of Philippine history as it happens. Note: Top image and quote above are from the press release for the event.